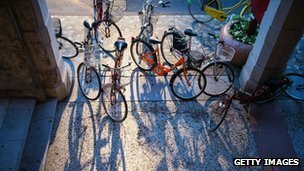 Italians bought more bicycles than cars in 2011 for the first time in decades, according to local media reports. Last year some 1.75 million bicycles were sold, about 2,000 more than the number of new cars registered, La Repubblica newspaper reported. It attributed the change to a slump in car sales during the economic crisis and the rising price of petrol, as well as bikes coming back into fashion. Car sales have slumped to the level at which they stood in 1964, it said. Though bicycling has a strong tradition in Italy, the centres of big cities are largely dominated by cars and scooters. Ahead of a cycling conference being held in Italy this weekend, President Giorgio Napolitano appealed to Italians to “catch up” with other European countries by making their roads more cycle-friendly.